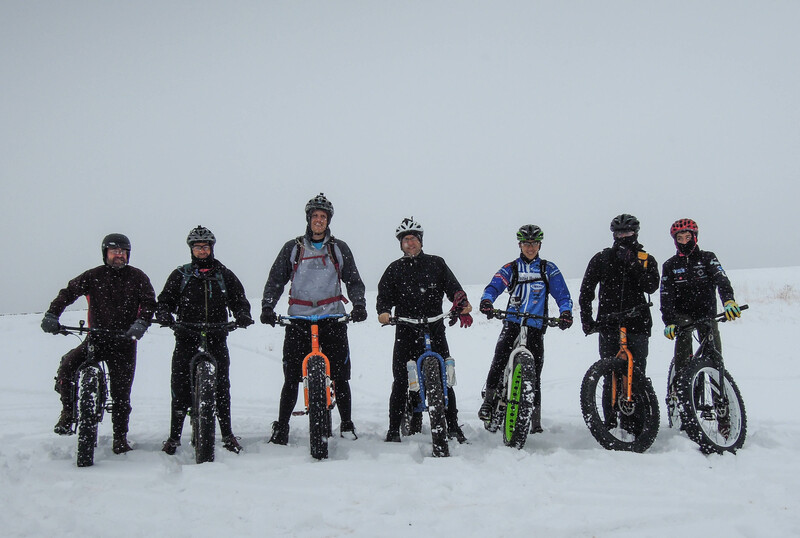 Today was our first Fat Bike Brigade group ride and we had a total of seven riders ranging in age from 14 to 54. I would call that a success. And we woke up to our first significant snowfall of the season. Though it was snowing this morning it was not really sticking to anything so we decided to drive up to Heber Valley where it is usually 10 degrees cooler. 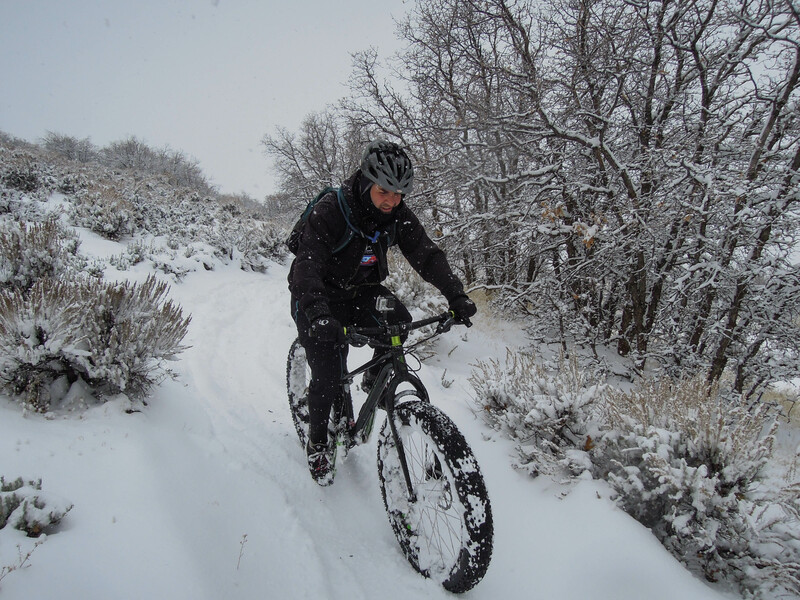 We were a bit surprised to find about 6 inches of snow at the trailhead for the Coyote Canyon Loop. 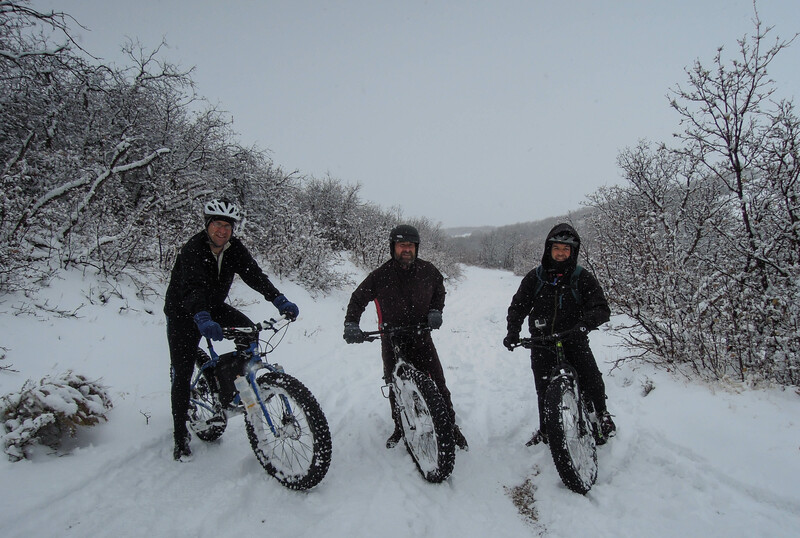 For most of us it was the first time to ride in the snow. 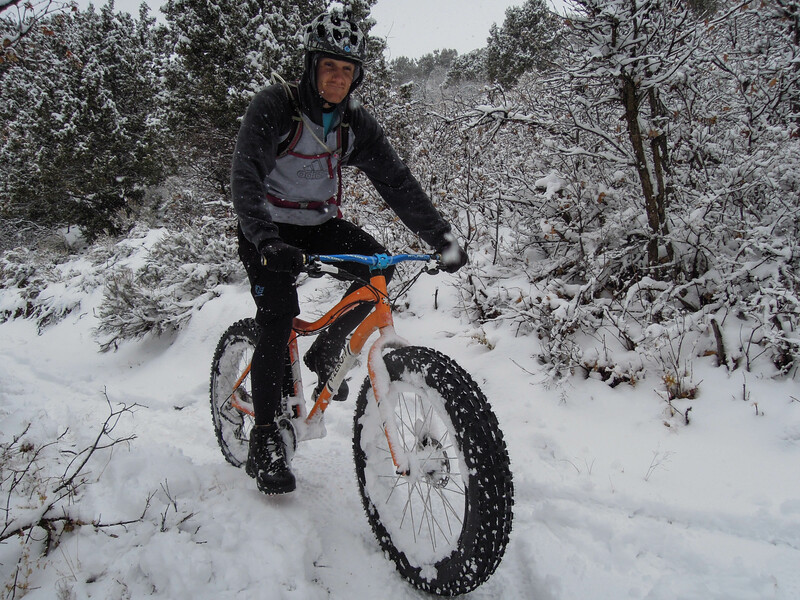 Alex had one season of fat snow riding behind him, but this was his first time out on his new 9:Zero:7 fat bike with 190mm hubs. He had it set up with Bud and Lou tires. 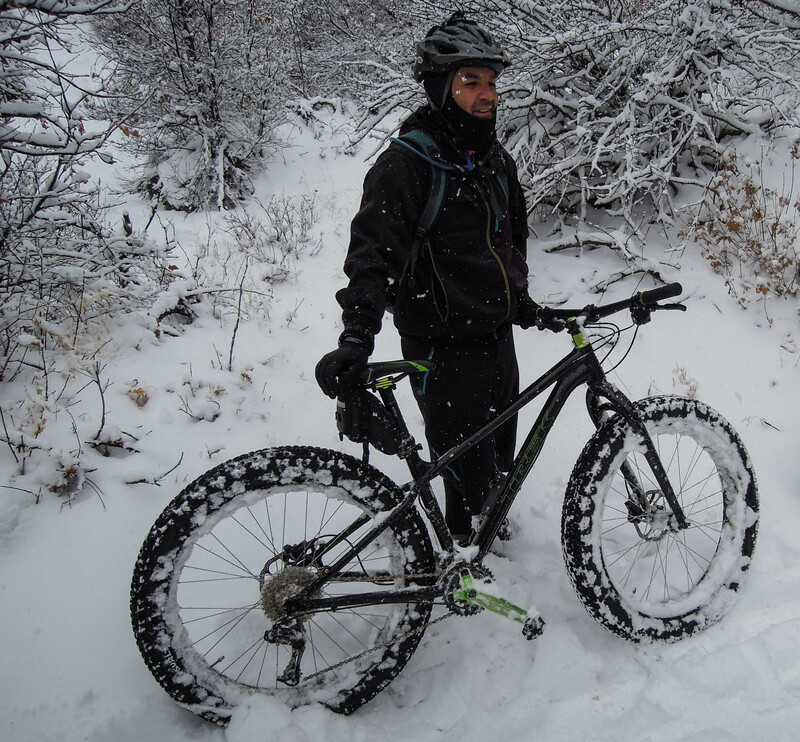 He was loving the extra traction and flotation of those burly 4.8″ tires. Alex with his new 9:Zero:7 bike. 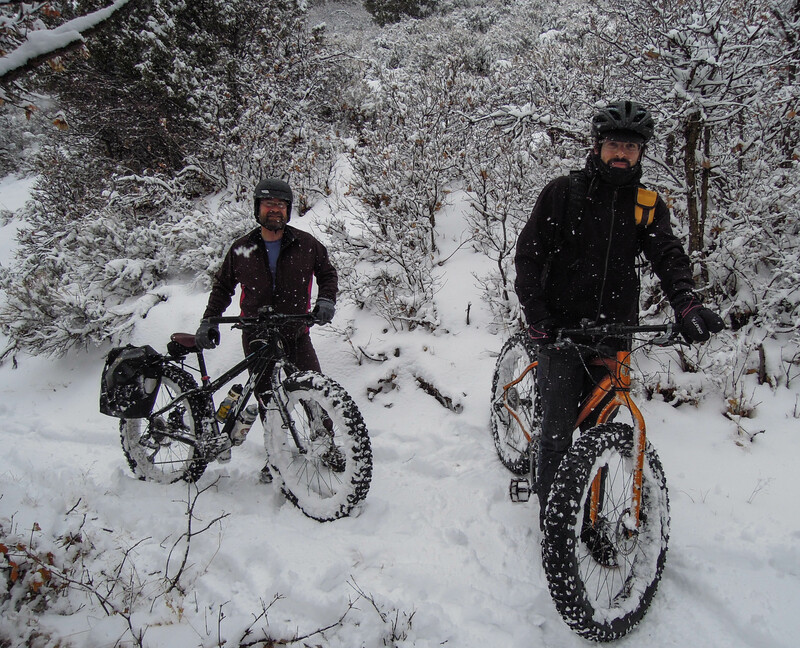 It was a revelation to us that how well these bikes do in the snow. This is a singletrack trail so there was no snowmobile tracks or any other kind of grooming. Breaking trail was quite fun, but at the same time pretty strenuous. For those in the back it was nice to have a trail packed out. Some sections of this trail are pretty rocky and that proved challenging, especially when we couldn’t see where they were. It made for slippery riding and a few wipe-outs, most slow, uphill, spin-out and tip over kind of crashes. 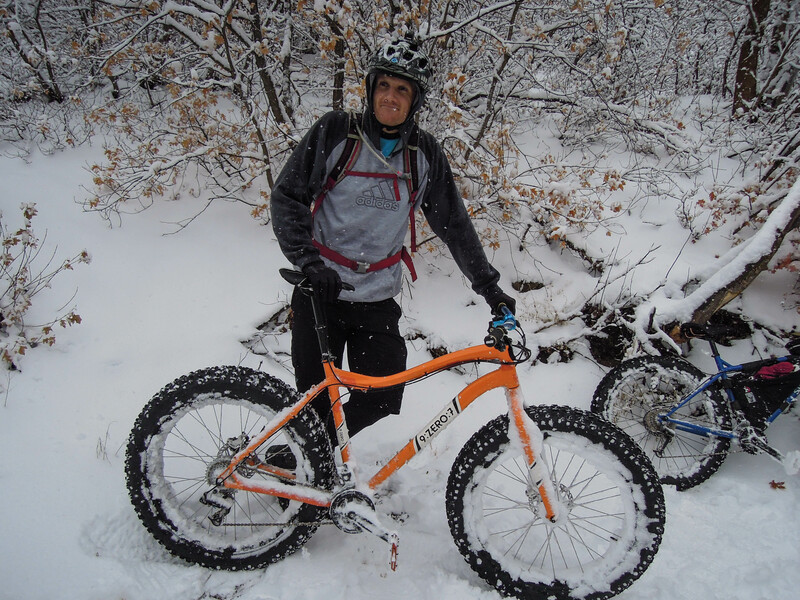 In total we had a 2013 Mukluk, two 2014 Mukluk 3’s, a 2014 Mukluk 2, a 2014 Surly Pugsley, a Trek Farley, and the 9:Zero:7. We had two young guys with us. 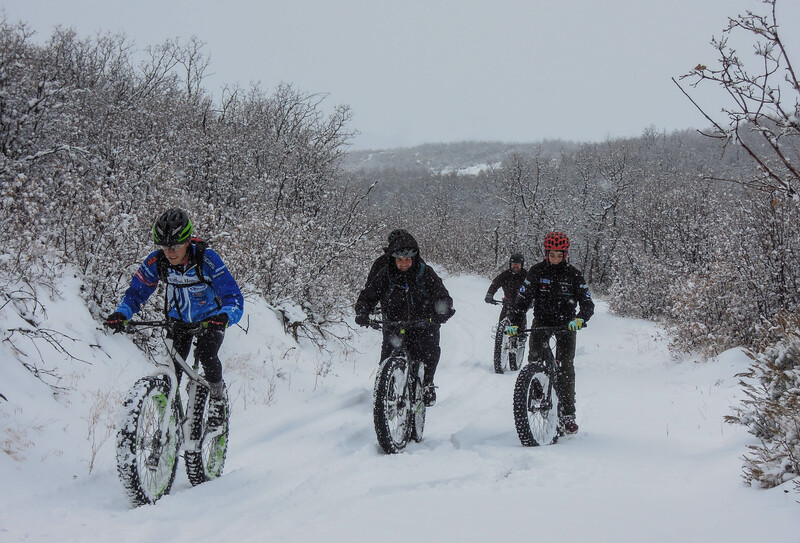 Gianni is an experienced road racer trying out a fat bike for the first time, and one of his first times off road. Harrison, (Bullet’s 16 year old son), raced this past season for his high school mountain bike team. 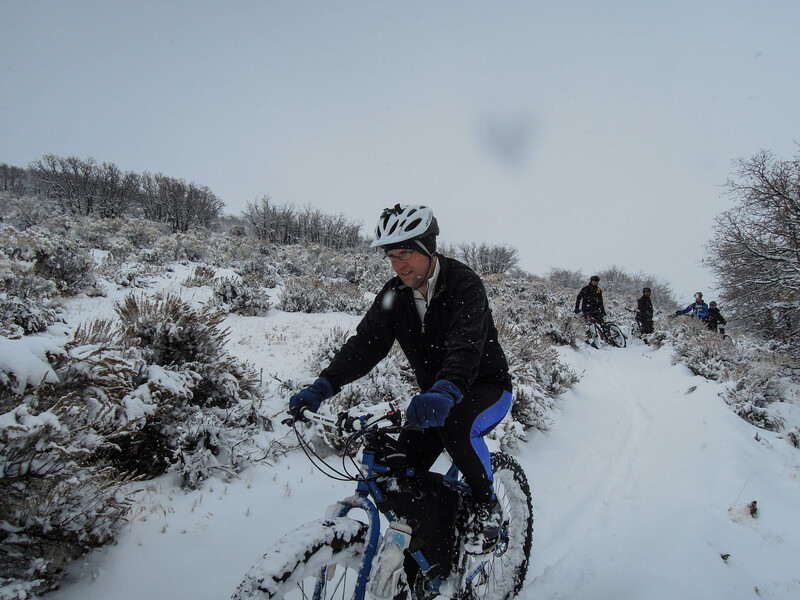 It was also his first time on a fat bike. 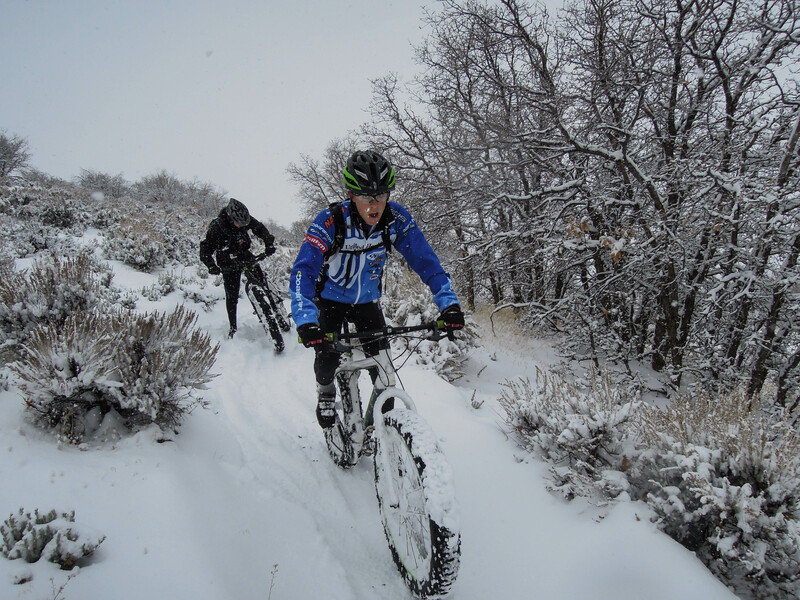 They were both riding demo bikes from Mad Dog Cycles in Orem. They both led the pack most of the way, especially on the downhills. We all took turns breaking trails. Bullet on the nimble Trek Farley. We only spent literally 20 yards on this fire road. From L to R: Harrison, Bullet, Doc, Gianni. We started at the Riverview Trailhead and took a right at the junction to do the loop counterclockwise. The riding was more strenuous than we anticipated. 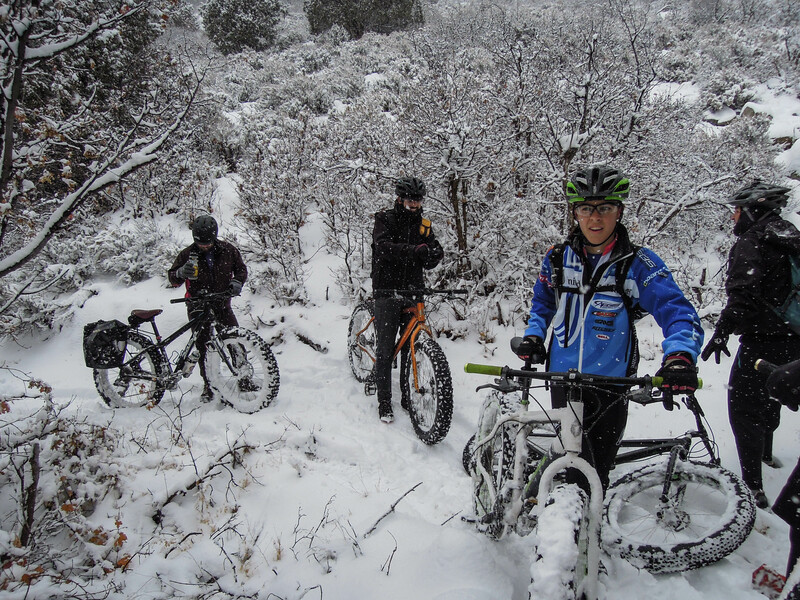 After riding about 7 miles we were probably halfway up the switchbacks and decided to have a pow-wow. 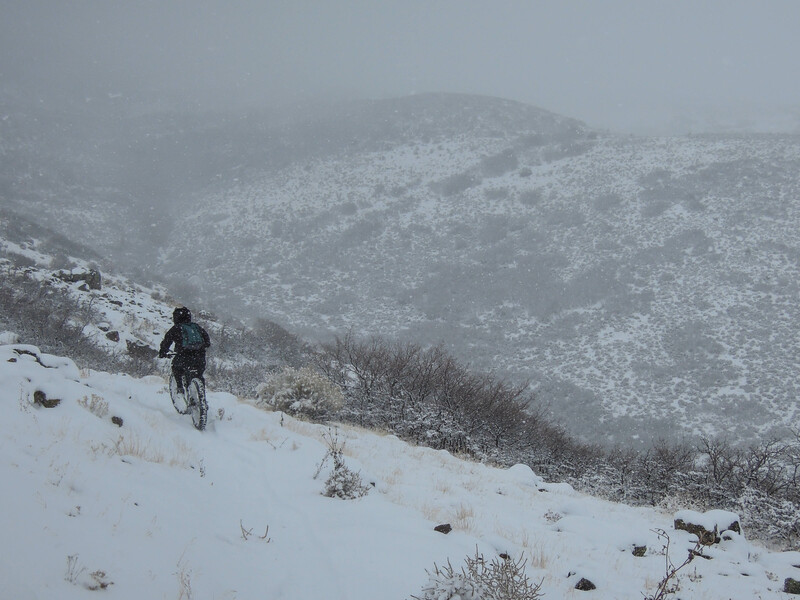 We could continue on the loop, and breaking trail (about 6-8″ of new snow), or we could turn around and enjoy riding down the now packed out trail. We were getting a bit tired and we liked the idea of riding down a nice packed out trail. So we turned around and headed down. It snowed the entire time we were out, so our tracks weren’t as packed out as we thought they would be. They had partially filled back in with snow. 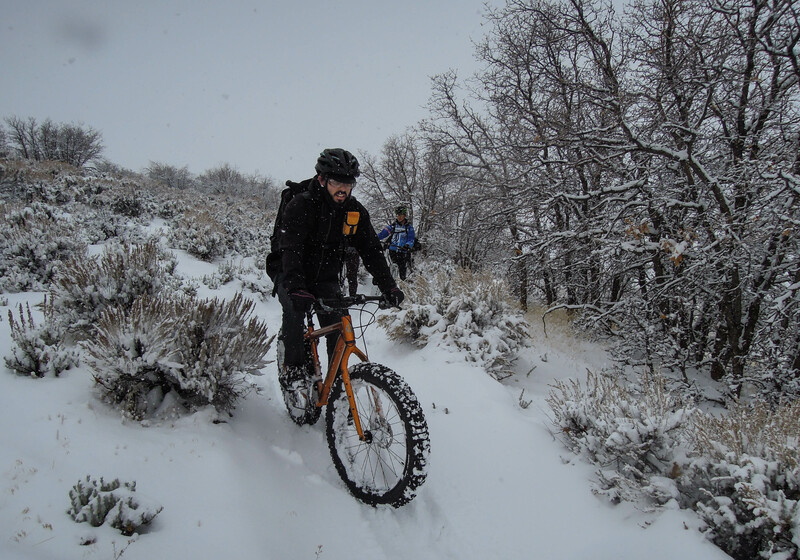 We also learned that riding in the snow is quite a bit slower than riding in dirt. 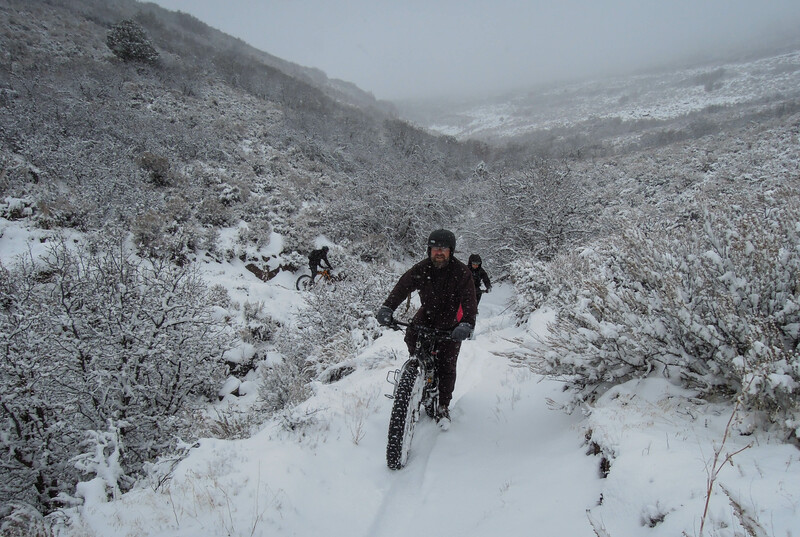 At one point I got going faster than I should have, hit some snow covered rocks, careened toward the edge of the trail, hit the scrub oak until my bike got caught up, then was launched over the bars through the scrub oak. I hit my head on a very large rock as I was tumbling along. I hit hard, cracking my helmet clean through, but fortunately not cracking my head. You’re foolish if you don’t wear a helmet—they can literally save your life. I had a headache and wrenched neck, but was okay. I rode a bit slower after that. And I’m really grateful for excellent helmet technology. Kent on a new Mukluk 2. Gianni, the young road racer on a Mukluk 3 demo bike. Harrison, high school mountain bike racer. Doc sporting his new winter helmet, the Lazer Dissent. Alex on very fat tires (Bud and Lou). We had a great time riding 14 or 15 miles (Strava’s got turned off prematurely). I was having so much fun I didn’t even bother to look at my watch, but we were out for probably about 4 hours. 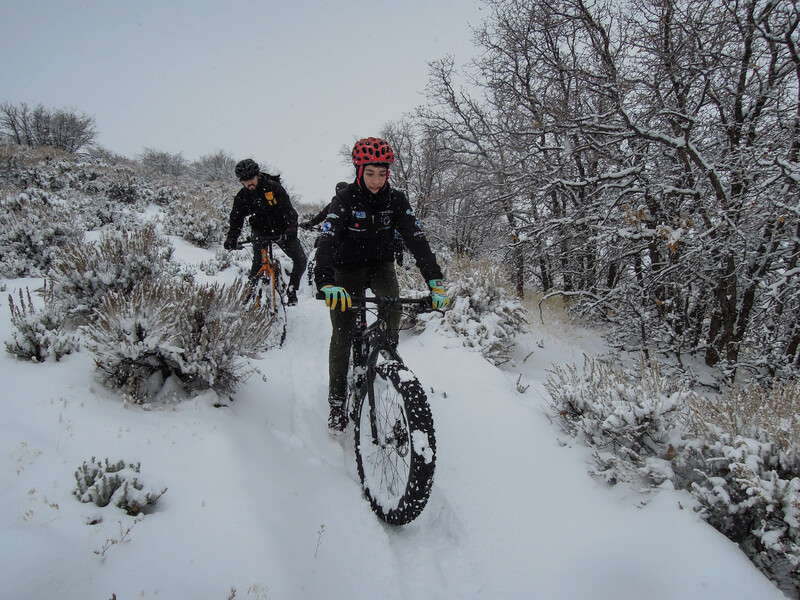 We’ve been having a great time on our fat bikes riding dirt, but now we know what all the hoopla is about riding in the snow. It’s really quite remarkable where these bikes can go. I imagine a packed out snowmobile trail will be even easier and faster. We’re still working out our winter riding clothes. I was wearing a pair of gore-tex low-top light hiking shoes with wool socks. My feet were warm the first half of the ride, but then my toes got cold. I realized that it was likely due to the fact that your feet are constantly plowing through the snow on the edge of the trail. Most of the time our shoes were covered with snow. Boots and gaiters are in order next time. This was about as clear as it got all day. Most of the time we could not see the next ridge. Here is a video of the ride. Looks like a great day for a ride! 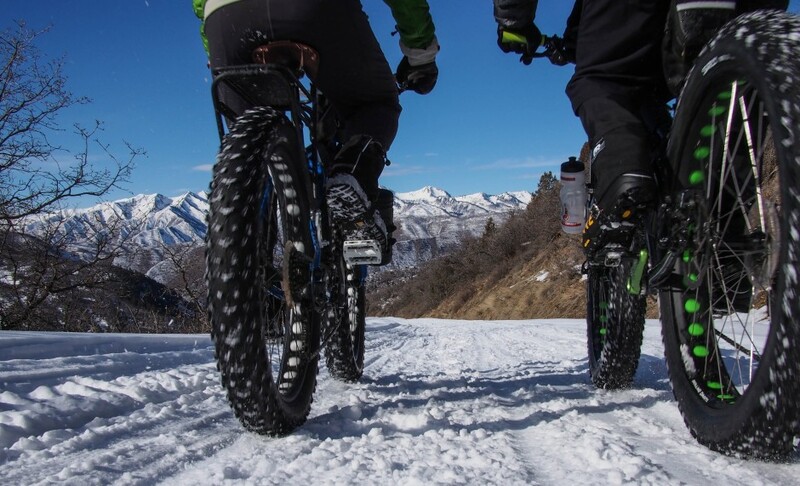 The realization of what these bikes can do in snow is a big mind opener!! Glad all of you now know what to expect!! Just got a new to me 2014 Farley. I live in the south. No snow all single track. Any suggestions for fast tubeless tires for trail conditions? My Nate came with a nice hole in the sidewall. Nate tires are OK. I could climb a tree with them. In loose pine straw I slide when cornering. Are Mission 4.0 s good in dry trails? Will they fit a Farley? Looking for tires to go tubless. I see almost no one on fat bikes here. Got a good deal on used fat bike. Lots of 29+ &650b + lately. I would be thankful for any advice.